With margins in metal manufacturing under constant pressure, an active equipment management strategy to improve the core Overall Equipment Effectiveness (OEE) metrics of availability, performance and quality can help operators realise their lean ambitions and turn losses into profits. Norican Group shares insights from customers and foundry owners that have yielded productivity gains by implementing strategic, highly proactive equipment management programmes focused on eliminating downtime, reducing scrap and slashing waste to enhance OEE. Properly maintaining and upgrading plant equipment maximises uptime, expands functionality and extends the working life of machines while avoiding the huge capital cost of buying brand new equipment. In this era of rapid innovation, flexible maintenance partnerships, digital remote access and expert training, there are many further opportunities for companies to improve equipment management. Adopting a strategic, aligned approach that covers every piece of installed machinery and identifies the opportunities to improve productivity, quality and resource control while mitigating risks means it is possible to improve equipment performance, move closer to long-term OEE goals, increase overall profitability, and ultimately keep your customers satisfied. Across Norican Group, machine maintenance programmes and aftermarket services, such as refurbishments, retrofits, regular service packages and Equipment Modernisation Programmes (EMPs), are helping customers to improve availability, performance, quality and overall OEE. This is evidenced by real savings and performance gains. One example is StrikoWestofen’s upgrade of a 17-year-old StrikoMelter for the Česká zbrojovka foundry in the Czech Republic. The results of the enhancement exceeded all expectations, bringing energy consumption down by 20% and improving melting performance by 40%. Full return on the investment took less than a year. Though some machine components are susceptible to wear, the main structure of a machine is built to last for decades. This means repair, retrofitting or upgrading are almost always possible. An EMP completed in just a week by Wheelabrator for the CMB branch of China Metal International Holdings Inc in Suzhou City, doubled the capacity of a trusted machine and increased its efficiency by 40%. An EMP programme can breathe new life into existing machines that have long since repaid their initial investment while improving resource control at the same time. By opting to have four 15-year-old StrikoMelters from StrikoWestofen relined and upgraded, Skoda Auto managed to reduce energy consumption at its Mladá Boleslav site in the Czech Republic by 10%. Improvement isn’t limited to the very latest, cutting edge innovations. Directly replaceable next-generation parts can also have a transformational effect on OEE as Chief Process Engineer at AVK, a Wheelabrator customer, Leszek Rogacz relates. “We initially contacted Wheelabrator to ask them to upgrade the wheels on our oldest machine. The new TITAN wheels surpassed our expectations. Not only has our parts sourcing become more steady and straightforward, which allows us to plan maintenance better and reduce downtime, but the significant reduction in cycle time has given us more production capacity as well. With results like that, it was just common sense to ask Wheelabrator to replace the wheels on one of our other machines too." Foundries and production plants are currently undergoing a digital revolution, one that legacy machines can join too. Across Norican Group, intelligent control systems are being developed that can bring digital transformation to existing equipment. By gathering data and overseeing machines and processes, high-tech digital innovations such as the DISA RMS (Remote Monitoring System), HMe from Italpresse Gauss and pipeline developments from Norican Digital keep a tight grip on productivity, quality and resource control. Offering improved control, real time oversight, reduction of unplanned maintenance and downtime, minimised error margins and new data insights, such systems transform operations and help operators reach previously unattainable productivity highs. “Since the installation of our DISA RMS, we now have an inside-out view on all of our three DISA machines. This is contributing remarkably to increase the efficiency of our maintenance resulting in a more smooth daily production and with less unplanned downtime." Nurturing machinery to ensure it performs at its best for decades doesn’t begin or end with an EMP or retrofitting the very latest innovations. Periodic, pre-organised service checks support efficient day-to-day operations, freeing up engineering and operational staff to conduct timely shutdowns, plan workloads and focus on other higher value tasks, all while knowing failure risks have been minimised. “From an operational perspective, the predictability we’ve now got is hard to beat. We know who’s coming in and when; we always know where we’re at with each machine and the regular visits from Wheelabrator are a safety net that has restored our confidence in our own production timescales. We’ve never had this level of reliability with our blast machines, and major disruptions to production were a constant possibility. Machine-specific training is another significant factor in that can have a transformational impact. Beyond building up the skills of foundry workers and engineers with maintenance-level, inner-working knowledge that they can use every day, training turns the foundry workforce into a highly-informed first line of defence and emergency response unit. This higher level of staff understanding makes it easier for OEM technicians to guide operatives during a critical fix and can reduce the number of costly call-outs. A proactive equipment management strategy has to include training which is why every Norican Group technology provides expert technical training that can be delivered on site. Adopting a strategic, proactive and responsive management approach that takes the business closer to maximum OEE can be challenging. For example, if machine systems can’t communicate with each other, gaining system-wide oversight and keeping track of each machine’s respective task, supply and maintenance status will be difficult. Even seemingly simple tasks such as ordering parts can mean hours on the phone calling multiple suppliers. For this reason, Norican Group has created a complete, highly-integrated aftermarket support network underpinned by extensive global infrastructure. By bringing machinery and maintenance expertise together, experts can be at your side during every step of the manufacturing process, from parts formation and preparation right through to finishing – wherever you are in the world. 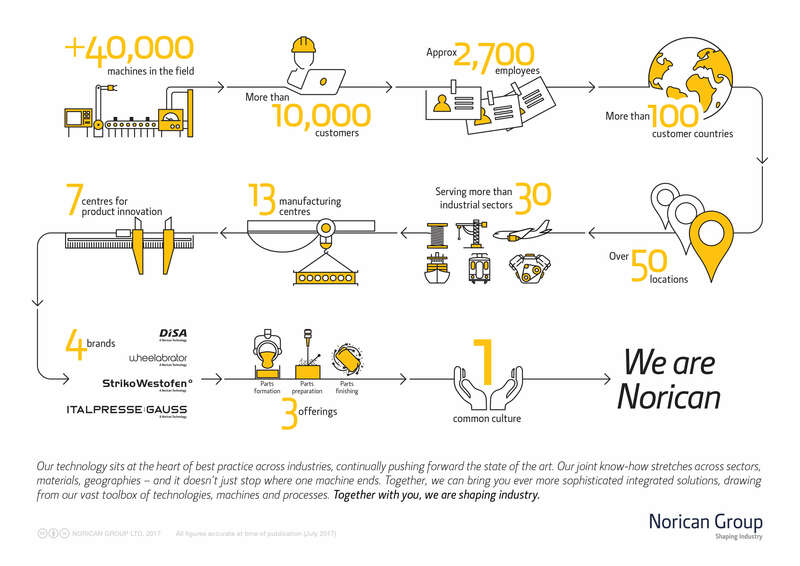 With 2,700 staff in 50 countries, Norican Group offers technical breadth, local language ability and extensive parts stock to fully support 40,000-plus machines operating in the field.